Osteoporosis is assuming grave proportions in India, with 1 out of every 3 women and 1 out of every 8 men being diagnosed with it. An inadequate calcium intake in the Indian diet is one of the main reasons for the rising incidence. Lack of exposure to sunlight resulting in low levels of vitamin D (which aids in calcium absorption) is another important factor. Osteoporosis mostly affects the elderly (men and post-menopausal women), who now comprise a greater proportion of the general populace. What makes the disease serious is that it progresses without symptoms, remaining largely undiagnosed for a prolonged periods in the early stages. Moreover, despite all the medical advancements, there is no treatment modality presently available to completely reverse the condition. Only an early diagnosis and prompt medical intervention can halt its progression and improve the quality of life. Osteoporosis management requires a holistic approach that includes a combination of pharmacological and lifestyle modifications. Docplexus’ latest survey attempts to understand how doctors in India diagnose and manage osteoporosis. It forms a part of the series to bridge the communication gap between doctors and pharma/medical device/diagnostic companies. Aim – To understand doctors’ opinions and practices for managing osteoporosis in India. Survey Methodology – A nationwide online poll on Docplexus members. Sample Size – The survey was completed by 200 physicians, out of which 65% were orthopedics and 25% were general practitioners. 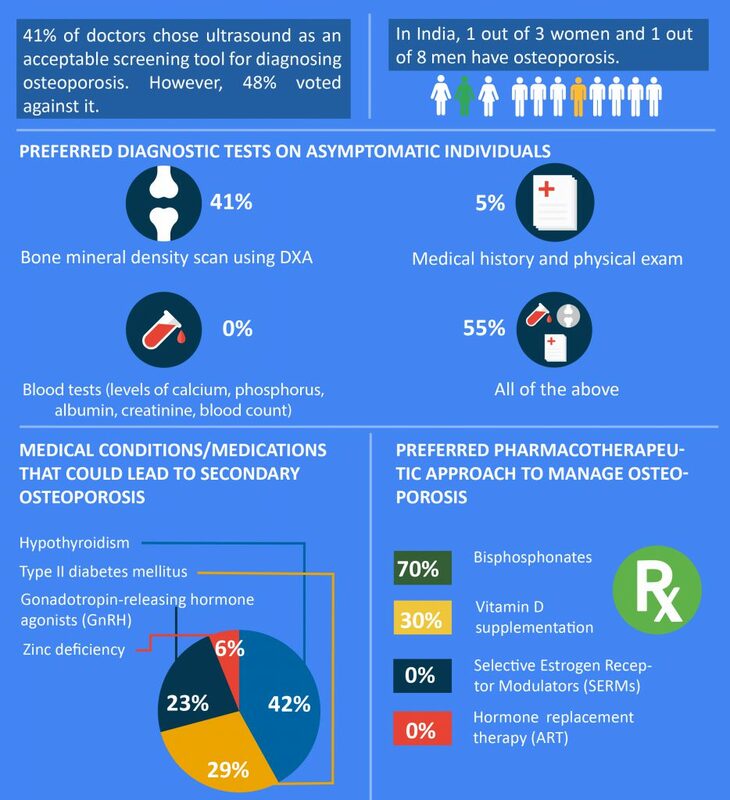 A majority of doctors do not think ultrasound is a reliable screening procedure for determining a case of osteoporosis – While 48% of respondents did not perceive quantitative heel ultrasound (QUS) as the definitive test of bone density assessment, 41% of respondents vouched for this test. 10% of the respondents were undecided. A major factor in favor of these tests is that they cost only about one-fourth of the conventional bone scanning devices and are mobile, easy to perform and radiation-free. However, most Indian doctors opine that QUS is at best, a pre-screening tool for osteoporosis. It cannot be used in follow-up testing or to monitor therapy. QUS is generally performed when there is the lack of access to DXA (Dual-Energy X-Ray Absorptiometry) – the ‘gold standard’ for diagnosing osteoporosis. This is particularly true in the Indian scenario where DXA testing is severely lacking, even in cities. Thus, there are huge unmet needs that diagnostic device manufacturers can fulfill by bringing out more affordable and convenient testing options. Conclusive diagnosis of an asymptomatic case is made only after conducting more than one tests – More than half of all respondents conduct an all-round assessment of the individual before diagnosing a case of osteoporosis. It comprises medical history and physical exam, blood tests and bone mineral density (BMD) scan using DXA. Blood tests, by themselves, are inconclusive and hence, found no takers in the survey. On the other hand, 41% of the respondents felt that BMD scan using DXA alone was enough to arrive at a diagnosis. The DXA at hip is endorsed by WHO, the International Osteoporosis Foundation (IOF) and the National Osteoporosis Guideline Group (NOGG). This is because the accuracy at the hip exceeds 90%. A follow-up DXA is often recommended after two years or more. It is best that the follow-up test is done at the same place as the first one. This is because there are different models of DXA instruments and measurements are easier to compare when done on the same model. This reiterates the need for better availability of diagnostics in the country. Hypothyroidism is the biggest cause of secondary osteoporosis – 42% of all cases of secondary osteoporosis in India are attributed to an underactive thyroid. Diabetes Mellitus was the second most leading (29%) risk factor of secondary osteoporosis. Both type 1 and type 2 diabetes patients with poor glycemic control are more prone to osteoporosis-related bone fractures. Treatment of secondary osteoporosis is more complex than that of the primary one as it involves treating the underlying cause. Bone loss linked to hypothyroidism is usually reversed when the thyroid status returns to normal post treatment. Promotion of physical activities and adequate intake of calcium and vitamin D supplements are of great importance in preventing the occurrence of osteoporosis in diabetics. GnRH agonists like goserelin acetate and leuprolide acetate account for 23% of all secondary osteoporosis cases. These are used to treat prostate cancer, endometriosis and female infertility. Their intake leads to bone loss by increasing bone turnover and reducing mineral density. Concurrent administration of supplemental calcium and vitamin D is also found to be ineffective in such instances. 6% of all secondary osteoporosis cases in India are linked to zinc deficiency. While there is high awareness of the role of calcium and vitamin D in maintaining bone health, little is discussed on zinc being a vital nutrient in the prevention and reversal of osteoporosis. Low intake of zinc lowers the secretion of IGF-I, a critical agent in the regulation of bone formation, re-absorption and homeostasis. 70% doctors prescribe Bisphosphonates for osteoporosis management – Bisphosphonates (alendronate/risedronate) are the most common first-line drugs to manage osteoporosis in India. Their chemical structure allows them to bind to mineralized bone surfaces and reduce bone turnover, leading to an increase in lifespan of skeletal tissue. They are usually administered orally, however, in moderate to severe cases, they may be given intravenously. Oral administration is associated with nausea, esophagitis, gastritis, gastric ulcer, etc. 30% of the respondents opted for Vitamin D supplements to treat osteoporosis. In fact, many doctors consider vitamin D and calcium supplements necessary for a majority of post-menopausal women in India. Often, vitamin D is used in combination with bisphosphonates as the antifracture efficacy of antiresorptive agents is maximized in cases of optimal vitamin D repletion. However, calcium interferes with the absorption of bisphosphonates. Therefore their intake has to be spaced out. Hormone replacement therapy (ART) and Selective Estrogen receptor Modulators (SERMs) were not chosen by any respondent as a preferred pharmacotherapeutic approach. While ART is associated with adverse side effects like cancer of the breast and cardiac ailments, SERMs are linked to blood clots, stroke and endometrial cancer. Most common reasons for noncompliance of osteoporosis therapy is the lack of awareness and visible benefits of the medicine. Also, these medicines need to be taken on a regular basis for extended periods. Therefore, it is necessary to take measures to educate the populace regarding continuing the treatment for the recommended duration. 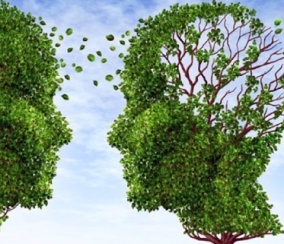 Drugs with better bioavailability and safety may also improve compliance rates. Docplexus provides its pharma clients with similar data-backed insights that assist them in developing products based on their market’s specific needs. It also offers them the knowledge, expertise and tools to successfully deliver their marketing messages.